PARIS - Finance chiefs of the Group of 20 rich and developing nations said Saturday that they will ensure the International Monetary Fund has the resources it needs to help stabilize the world economy — a hint that they may be open to a bigger role for the fund in the eurozone debt crisis. However, there was still resistance to boosting the IMF's funding from several countries — including the United States. "We committed that the IMF must have adequate resources to fulfil its systemic responsibilities," finance ministers and central bank chiefs from the G-20 said in a statement after a two-day meeting in Paris. They said they would discuss the IMF's funding when G-20 leaders assemble in Cannes, France, in early November. As debt troubles in the eurozone threaten to spin out of control, France and some other countries have pushed for the IMF to help Europe keep the crisis from spreading to economies such as Italy and Spain. Those two countries are considered too big to be bailed out by other euro countries. Their financial collapse could drag the currency union back into recession, cause numerous bank failures and send shock waves around the world similar to what happened after the 2008 bankruptcy of U.S. investment bank Lehman Brothers. Until now, the IMF has funded about a third of the bailouts of Greece, Ireland and Portugal, but helping the eurozone to stem contagion would require a broader use of resources, such as buying bonds on the open market, that go far beyond the fund's traditional role of providing rescue loans to cash-strapped countries. A precondition to any expansion of the IMF's role is for the eurozone itself to take more radical action on stemming the crisis at a summit on Oct. 23. At that meeting in Brussels, the currency union's leaders are expected to sign off on a scheme to maximize the impact of their €440 billion ($600 billion) bailout fund, a plan to recapitalize banks across the continent to ensure they can withstand worsening market turmoil, and a second bailout for Greece. U.S. Treasury Secretary Timothy Geithner still opposed giving more money to the IMF, but he appeared open to an expanded role for the fund. 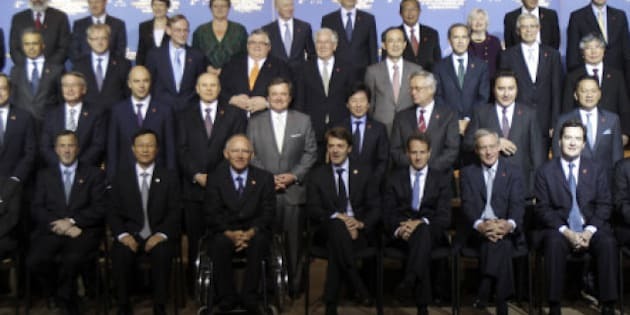 "The members of the G-20 have a strong interest in supporting Europe, and we will continue to do so through the IMF," Geithner said. However, he stressed that the fund "has a substantial arsenal of financial resources," adding that the U.S. supported further use of "those existing resources" alongside boosted European efforts. Officials warned earlier Saturday that an expansion of the role and funding of the IMF was far from a done deal, since it would force many poorer countries to help bail out Europe, one of the world's richest regions. The U.S. and others have long argued that the eurozone has more than enough money to spend its way out of the crisis. Even Germany — which pressed for the IMF to be included in the eurozone's crisis management in May 2010, when Greece became the first bailout victim — said the fund already had enough resources. French Finance Minister Francois Baroin said the ministers and central bankers did not discuss how much additional money the IMF might need. The new managing director of the IMF, former French Finance Minister Christine Lagarde, declined to comment in detail on the talks about new funding for her institution. "What is indispensable is that IMF's resources are sufficient to meet the needs of its members," she told journalists after the meeting. Associated Press Business Writers Sarah DiLorenzo and Greg Keller contributed to this report.